One year after I published this review, Epubor has brought a whole new version of this wonderful program. You can directly check the new part by clicking this link. I am reading-addicted for years, when I am in college, I finished reading over 300 books in total in the library. After starting my career, I bought an iPad for reading, then a Kindle Paperwhite. For long time I am seeking a software to convert my purchased books to EPUB/Mobi as I randomly choose device to read, sometimes my iPhone, sometimes my iPad, and sometimes my Kindle. But I always buy books from Amazon. Then you might ask, why I need to convert the book? With iPhone and iPad I can install Kindle reading app for reading. Yes I certainly can do that, but in years I prefer reading with iBooks app even I never buy a book in iTunes store. At very early time I found the freeware Calibre and used it for years, but it gets more and more bloated, and in my personal opinion it’s not easy enough to use. Days ago I was introduced a program by one of my friend, he is never a tech-savvy and he likes this program a lot, which is called Epubor Ultimate Converter. I used to introduce him Calibre and he cannot even figure out how to use it, while he said the Epubor Ultimate Converter is pretty handy. Then I downloaded it from the official site, installed it and got the program launched. The first glance at it I know it’s way easier to use than Calibre. I can say it is the program for those people who are not familiar with computer skills. The right side built-in library automatically scan my Kindle’s content and display all the books synced via Kindle windows app. Then I just need to drag the files into the main windows. The program process all the load-in books (in fact remove the DRM), then I just need to choose the output format and click “Convert”. 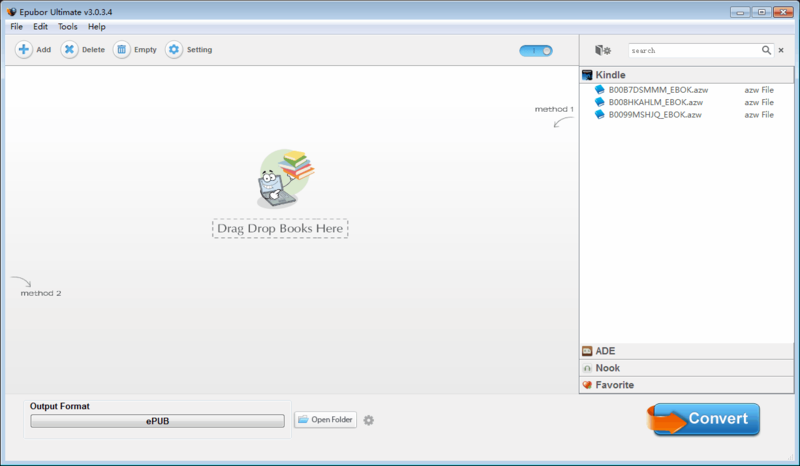 After the conversion finishes, the output folder opens by the program, then I get all my Kindle books converted to EPUB. Another highlight is, when I plug my Kindle with computer, it also recognize my Kindle and display it in the right side built-in library. Here the magic happens, I need not to input KSN for removing DRM. When I use Calibre for processing Kindle books, I always need to manually input KSN when the books are copied from my Kindle, not synced via Kindle windows app. For more features, you can see the summary below. I only use this program to process my Kindle books, and it works flawlessly. The official website says it also supports Adobe DRM protected books and Nook books, however, I didn’t buy any item from those stores, so I cannot tell you if it will also work well on them. If you don’t like Calibre’s interface and how to use it. Epubor Ultimate Converter is your first choice. It doesn’t come with many bloated features, but just focus on converting purchased eBooks and covers most of the popular formats and eBook stores. And I’ve got a 10% off coupon code from Epubor Inc., below is the 10% off order link. Buy the program with the link above is 10% cheaper than Epubor official website. Yes it doesn’t bring many eye-catching new features, however, in this industry, they are almost hitting the roof. At least, I see a team who is still working hard to make this program better and better, that’s the precious thing. You can take a glance at the new version by this video. If want more information, please visit their official website. By the way, the discount purchase links above are still valid.